I love cats. My last trip (Nov 2010) to South Africa included a 4 night stay along the Garden Route – 1 night in Storms River and 3 in Plettenberg Bay, a thoroughly beautiful section of the Garden Route. When I discovered a wildcat sanctuary close to Plettenberg Bay, Tenikwa, I knew I had to visit and booked a Sunrise Walk with Cheetahs for myself and my friend. I was really looking forward to this activity as one of the highlights of an overall 16 day trip to South Africa. We arrived early on a beautiful sunny morning and after a cup of tea were led out to walk the cheetahs. There were two guides, two cheetahs and a group of about 7 tourists in all. The male cheetah, Chester, appeared a bit agitated from the outset and took a paw swipe at one of the guides early on, but this was laughed off by them with a gentle chastise. The female cheetah was much more placid and we enjoyed walking her (on a lead) and when she lay down for a rest (which surprisingly was very often!) she was very happy for us to pet her and purred loudly. I did not attempt to pet Chester! The first mishap we had was when the female brushed against an electric fence and took off like a bolt of lightening which was a bit unsettling. The second was much more frightening..
One of the guides had stopped to give Chester a drink of water. This photograph of Chester was to be the last. After that, the lovely walk took a turn for the worst when Chester decided to attack one of the other tourists who (perhaps unwisely) was wearing a red t-shirt and who was filming via camcorder. Chester broke free from the guide and dragged the very frightened tourist to the ground who, by the time it was over, had lost his shoes and most of his trousers and gained some nasty scratches. During the attack the male guide tried to haul Chester off the hapless tourist, however the cheetah managed to pull free from his harness. After a few minutes, he left the poor tourist alone and we stood there in a frightened group looking in horror at the loose cheetah who was clearly very angry. The guides here do not possess weapons of any kind, however they were able to radio back to reception for assistance. The initial assistance arrived in the form of a third guide, again unarmed ,who could offer no real help in terms of catching the cheetah or removing us from the area. Finally, one of the owners arrived, the female partner in the husband and wife team who appear to own the sanctuary. In what can only be described as a “Born Free” esque moment, she calmed the cheetah by talking softly to him and petting him before he finally allowed her to put the harness back on him. She stayed with him whilst the other guards led us back to the safety of reception. The injured tourist was very shocked and once his cuts had been tended to and new clothing provided, he was driven to Plettenberg Bay for a check up, a tetanus jab and what turned out to be 8 stitches. What surprised and disappointed me the most was the attitude of the owners to the attack. They arrived back to reception and proceeded to attempt to find out the reason for the attack – but were determined that the reason was something we had done to antagonise him. The injured tourist and his friends, although annoyed that they were being accused of “having eyes that were too piercing and staring at Chester”, in my view, did not sufficiently object to the manner in which they were being blamed for the incident. Clearly the owners wanted to protect their business and the Cheetah Walk is their major offering, but from a safety perspective I would have expected Chester to be removed from meeting and walking with the public at a minimum. That aside, we managed to put the fright behind us when we moved on to the next part of our activity – which included meeting more cheetahs and entering their compound. They were lovely and even though we had been really frightened by Chester, we did not feel at all at risk with these other cheetahs. See below! Told you I love cats!!! 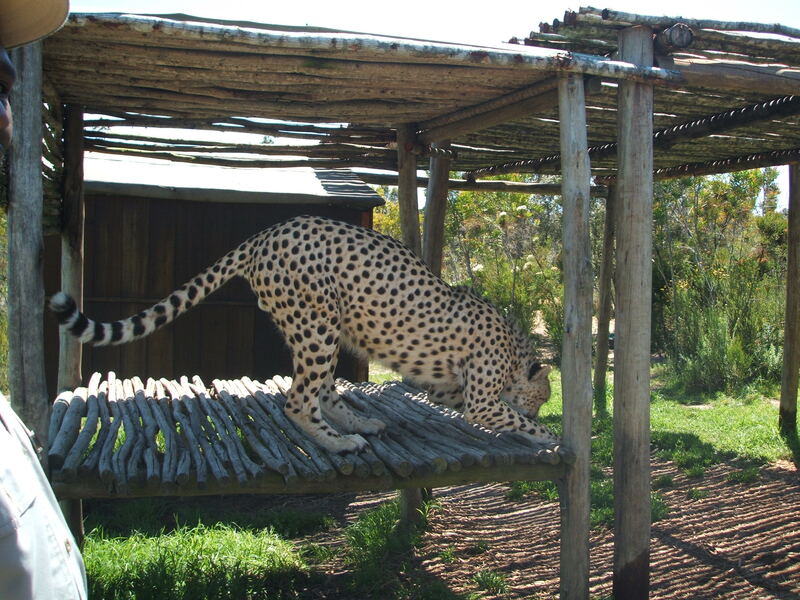 Would I recommend visitors to South Africa to do the cheetah walk at Tenikwa? In all seriousness, I couldn’t after what happened to us. But I did enjoy the Wild Cat experience which followed, and which included meeting (but not walking) different cheetahs who seemed much more at ease with us tourists! Hi, i am Daniel, the tourist attacked by chester. Your description was very realistic, congratulations! I definitely do not recommend this attractions for anyone…The lack of security and the responsability of the owners is huge!!! Are you the german guy with the big camera? Hi Daniel, no I am one of the tea drinking Irish girls with an unimpressive camera! Hope you have recovered from your ordeal. It was very frightening and I still think about it. Definitely not handled well by the owners and I wonder if it was indeed an isolated incident for Chester. Take care of yourself and I hope what happened didn’t ruin your trip to South Africa. Mary. I have just recently returned from South Africa and too had the enormous privilege of having Chester take me for a walk!! It was truly one of the best experiences of my life. I am sorry that Daniel had not such a good experience but cannot help thinking that when we participate in these types of experiences we must surely be aware that there will be a slight risk. These are after all wild animals and although these beautiful animals are more comfortable with us tourists than most We must accept that this could happen. As to referring to weapons I am much relieved to hear that the guides do not carry weapons of any kind. Sometimes we have to take responsibility for our own actions and decisions that we make. Me and my fiancee walked with Chester and the female (his sister?) in October (2016). It was an unusually cold day, so the lions were actively prowling their perimeters, and this was unsettling the cheetahs. On top of that, there was a troop of baboons hidden somewhere not far away in the forest, who had mistaken the cheetahs for leopards who prey on baboons, and consequently were making threatening noises for nearly an hour. All this was spooking the two cheetahs and they were very skittish. We were walking with the female, and to make matters worse we lost contact with Chester, who has a calming influence on the female. In one fateful moment, the guide ahead of us disappeared around the corner leaving us alone with the female, who stopped, and stared at me. I immediately looked away as we had been instructed, and I kept looking away for what seemed an eternity. Finally I made the mistake of glancing back at her and was greeted with a long, menacing hiss. Right there, I thought I was going to be attacked. All of a sudden she bolted, so fast that my fiancee could not let go of the harness in time and was pulled along for several metres. I have this incident captured on a video camera that I had attached to my belt. After that our hearts were racing, and we spent the rest of the walk in mortal fear. I do not exaggerate. The guides told us that the cheetahs are threatened by tall athletic people with deep voices (like me), so I was told to whisper and always avert gaze and stand at the back of the group. The remaining hour of the cheetah walk was the longest in my life. 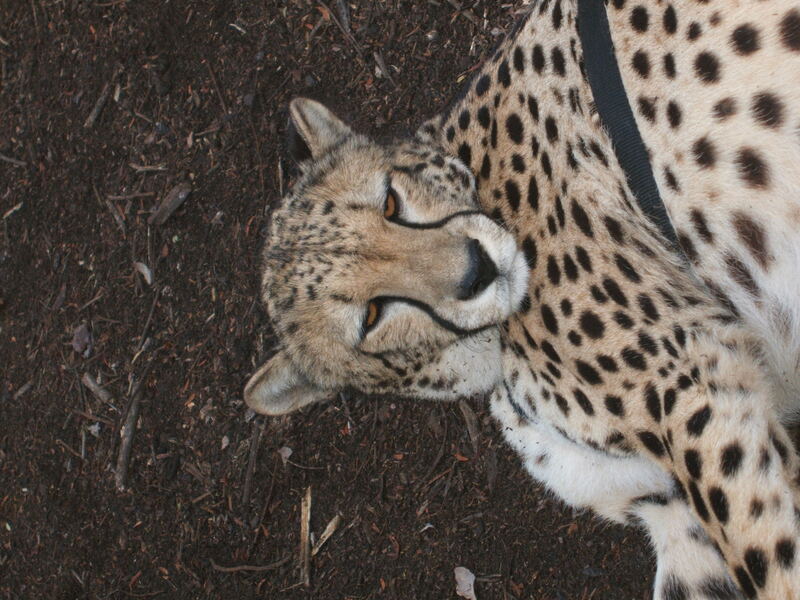 I loved the rest of the wild cat reserve, but I could never sensibly recommend the cheetah walk experience to anyone. I am so sorry that you also had a frightening experience there. 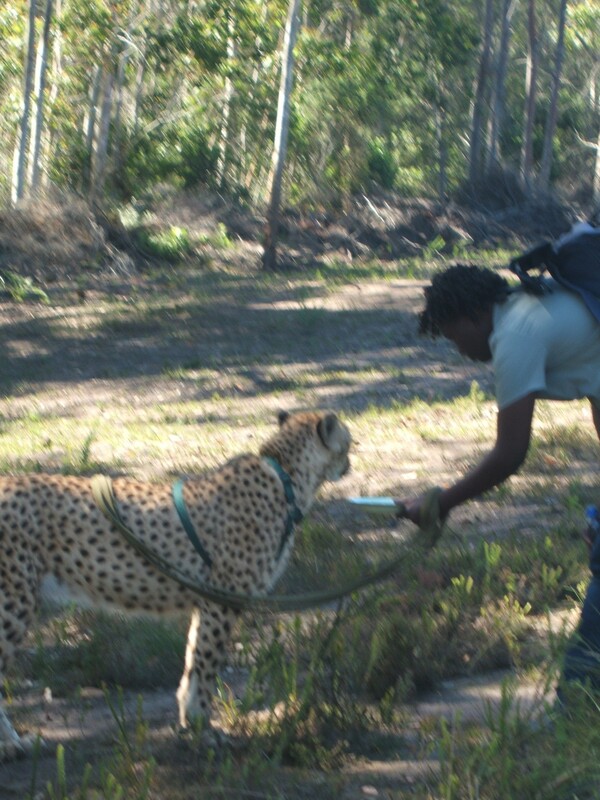 When we were there, and before Chester attacked Daniel, the female cheetah also bolted on us. Fortunately she wasn’t on the lead at that point, but something spooked her and she touched off an electric fence and took off. Same as you, I loved the rest of it but couldn’t recommend the walk. 6 years on and Chester is still being walked by the public! Wow!